About 1 in 5 children in Singapore suffer from Atopic Dermatitis. 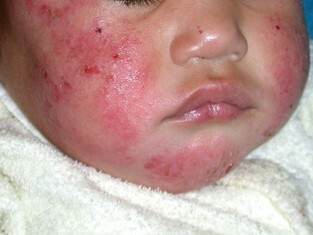 Atopic Dermatitis is commonly known as “Eczema”. Eczema is a chronic skin disease which often starts during infancy or early childhood. The condition may flare up periodically. Factors which may aggravate or trigger eczema include: heat, sweat, dust, stress, dry weather, infections and vaccinations. Eczema is a treatable skin condition. The medical treatments available are generally safe and effective. The general principle in treating eczema involves 1) Treating the inflammation of the skin 2)Restoring a healthy skin barrier. Eczema is an itchy skin condition. The affected skin may look red, flaky, cracked and feel rough and bumpy. Depending on the child’s age, eczema tends to affect different body sites. In younger infants, eczema tends to affect the cheeks, elbows, ankle region and body. As the child becomes older, the eczema “moves” to other areas such as the neck, front of the elbows and back of the knees. Eczema commonly affects the skin around the eyes too. Children with eczema are at higher risk of developing asthma, allergic rhinitis and food allergies. Children with eczema will invariably complain of itch, and this leads to frequent scratching. Sometimes, their sleep can be disturbed as a result of the itch. The scratching tends to aggravate the eczema, and increases the risk of skin infections. Thus, it is of utmost importance to treat and control the child’s eczema, and relieve the itchy symptom. How can I tell that my child’s eczema is infected? Eczema-affected skin is prone to having bacterial infections, especially if the child scratches a lot. When infected, the skin tends to produce some liquid discharge, causing it to appear wet. Another possible infection that can occur in eczema is a viral infection called herpes simplex infection. In herpes simplex infection, there may be tiny blisters, or tiny round erosions which tend to appear in clusters or groups. It is important to seek medical attention if you suspect your child has a bacterial or viral skin infection, as treatment should be started early. Why does my child suffer from eczema? Normal healthy skin functions as a “barrier” which “self-hydrates”/ “self-lubricates” and prevents environmental irritants and allergens from penetrating deeper. Children who suffer from eczema have an impaired skin barrier function. Their skin is unable to produce and retain moisture, and is unusually sensitive. The cause of eczema is complex and multifactorial. It is a chronic inflammatory skin disease where hereditary or genetic factors play a strong role, leading to a defective skin barrier and immune dysfunction, causing dry, sensitive skin which is prone to recurrent inflammation. Contrary to what many people believe, eczema is not caused by one specific cause eg a food allergy. Therefore, allergy testing is often unhelpful for majority of eczema sufferers. Eczema is not a disease which can be cured by simply identifying an “allergen” and removing or avoiding the “allergen”. However, it is noteworthy that children with very bad eczemas are indeed more prone to developing food allergies. In this situation, the food allergies may sometimes aggravate the child’s eczema. Children with food allergies often will have other symptoms such as diarrhoea, vomiting or poor growth. Is there a cure for eczema? What are the effective treatments for eczema? The treatment of eczema needs to be individually tailored, according to the severity, extent of eczema, and the age of the child. Topical anti-inflammatory creams and moisturisers are the main treatments for eczema. The most common topical anti-inflammatory creams are steroid creams. There are alternatives to steroid creams called topical calcineurin inhibitors. Steroid creams- Steroids have been around for more than 50 years and they are used in many areas of medicine. They have good anti-inflammatory, anti-allergy, anti-swelling and anti-itch effect. Steroid creams are the most widely available type of treatment for eczema. If used appropriately, they are highly effective for eczema and they are safe. There is a big variety of topical steroid creams available. They vary mainly according to the potency of the steroid. Topical steroids are also available in different preparations such as lotions, creams or ointments. In general, mild eczema can be treated with low-potency steroid creams; severe eczema may require treatment with more potent steroid creams. The use of topical steroids should be guided by a medical doctor. The medical doctor will prescribe the most appropriate strength and type of topical steroid for the child. Short- term, intermittent use of steroid creams is very safe and effective for eczema. However, prolonged excessive use of superpotent topical steroids should be avoided as it may lead to side effects such as thinning of the skin and easy bruising. The use of strong steroid creams should also be avoided on the face and around the eye region, as the skin over these areas are thinner compared to the rest of the body. Topical calcineurin inhibitors- Topical calcineurin inhibitors are alternatives to topical steroids. Their effectiveness is quite similar to medium strength topical steroids but they tend to be slower to work. The use of topical calcineurin inhibitors is especially preferred in cases of stubborn, persistent eczema on the face, or around the eye area, where prolonged or repeated use of strong topical steroids are to be avoided. Moisturisers- Moisturisers help to restore the skin’s healthy barrier function, and are essential in the long term treatment and prevention of eczema. With frequent use, they help to improve eczema and prevent frequent flare-ups of eczema. The ideal moisturiser is a rich moisturizing cream which is fragrance- free, and contains minimal preservatives. This is because fragrance and certain preservatives can cause skin allergies. It is important to apply a moisturiser at least 2 to 3 times a day, or more frequently, whenever the skin feels or appears dry. Application of moisturiser after a shower is highly recommended as the moisturiser will be absorbed more effectively. Bathing- Limit bathing to once a day. Excessive bathing will strip the skin of its natural moisture and oils, and will dry out the skin. Use lukewarm water rather than hot water. Fragrance- free bath oils can be used for babies who are bathed in bathtubs. Alternatively, opt for mild skin cleansers which are fragrance free, soap- free and low in preservatives. Avoid outdoor heavy physical activities when the eczema has flared-up. Keep the child in a cool environment whenever possible, as heat, sweat, prolonged sun exposure may aggravate eczema. Wet wraps refer to use of stretchable bandages or dressings which are pre-moistened with water. This treatment is useful when the eczema has flared up. The wet wrap should be worn on the affected arm or leg after application of medicated creams and moisturisers. The wet wraps have a cooling effect on the skin, and also helps to enhance the absorption of the medication creams and moisturiser. These treatments are usually considered for people suffering from severe, extensive eczema.